Is the Force a standalone instrument? What are some of the main hardware features of the Force? How much RAM does the Force have? Can external MIDI controllers be used with the Force to play its built-in instruments? What else can the USB ports do? How many tracks can be added to a project? Are the pads on the Force like the pads on Ableton Push products? Are the Force’s pads velocity sensitive? Does the Force support Ableton Link?? Will the Force adapt the speed of any .WAV sample automatically to a project’s tempo? What does the Force’s internal sound content consist of? Is it like the MPC X and MPC Live sound content? Can I remove the internal content on the Force to make space for my own samples? How much content storage space is available in the Force? Can I use external storage devices with the Force for additional storage space? Can the Force use MPC expansion content? Can I use my own samples on a storage device? Does the Force have built-in plug-in instruments? Does the Force also have effect plug-ins? Does the Force have a sidechain compression effect? How big is the Force’s touch display? What type of pads are on the Force? What types of knobs are on the Force? Does the Force require a power supply? What types of inputs does the Force have? What types of outputs does the Force have? Yes, the Force operates completely standalone from any computer or software. This makes it the ideal live performance tool. The Force features 2GB of internal RAM for running projects and hosting samples. Yes! Class compliant USB MIDI controllers can be connected to the USB-A type ports on the Force to input MIDI data. If a USB MIDI controller can be bus powered, the Force will supply the requisite power. The Force can also receive MIDI data input via its MIDI DIN input. In addition to acting as inputs for USB MIDI controllers, the USB-A ports on the Force can be used to connect external storage devices such as USB hard drives and flash drives and transfer files (samples, projects, etc.) to and from those devices. The USB-B port on the Force can be used to connect the Force hardware with a computer. Up to 8 audio tracks, 8 plug-in instrument tracks, and 128 Drum, Keygroup, or MIDI program tracks may be added to a project. A project can have a maximum of 128 total tracks. 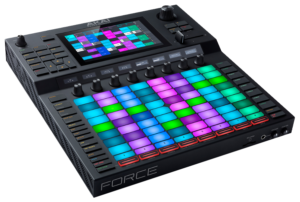 The 8x8 pad matrix on the Force has a similar feel to the pads on the Ableton Push and have the same workflow for note & clip launching, etc. Yes! The Force’s pads are velocity sensitive just like the MPC hardware. The pads on the Force are more sensitive than MPC and will require slightly lighter touch. There are sensitivity options available in the Force’s settings menu to customize its responsiveness to your personal preference. Does the Force support Ableton Link? Yes! You can sync the Force with other standalone hardware, computers & iOS devices that are Ableton Link compatible by connecting to your local WIFI network or using the Link port on the back of the Force. Use the WI-FI tab in your Force preferences to connect with your local WI-Fi network. Use the same network as your computer running Ableton Live to establish a connection with Ableton Link. Yes, the Force will analyze the embedded tempo data in the .WAV file. If no tempo data is embedded in a file, the Force will analyze the audio based on a specified tempo range that can be configured in its settings menu. Tempo can be edited when importing the file to match a project. The Force features new samples, loops, patterns, AIR effects plug-ins, and standalone instrument plug-ins. No, the included internal content should not be removed. This may cause problems on startup and will not free up space to store additional samples. If you'd like to view your own content separate from the internal content, use the Places menu in the browser to choose your connected storage device and view only the content stored on that drive. The Force has a total storage capacity of 16GB which is allocated for 10GB of pre-installed content, 4GB for the OS, and the remainder is available for user content storage. Yes! The Force can use external USB hard drives, USB flash drives, SD cards, and you can even install a 2.5" SATA drive (up to 2TB) inside the Force's enclosure! Yes! You can load your own .WAV sample files onto a storage device and use them in your projects. Yes! The Force can read MPC Drum and Keygroup programs as well as synth/effect plug-in presets. Yes! There are 4 standalone instrument plug-ins built into the Force including: TubeSynth, Electric, Bassline, and Hype. You will have thousands of sounds to choose from! Yes! The Force features the excellent AIR Instrument Effects suite that can be applied to audio and instrument tracks! Effects include delays, reverbs, compressors, etc. Duck yes! The Mother Ducker effect will allow you to apply sidechain compression on up to 8 busses. Use Mother Ducker to give your tracks that ubiquitous pumping effect heard in electronic and hip-hop music! The display’s diagonal measurement is 10.1” / 257 mm. The display screen measures 8.5” x 5.5” / 216 x 139 mm (width x height) and is a full-color, LED-backlit display with a 7” touch interface. The Force features a total of sixty-four (64) RGB-backlit velocity and pressure-sensitive pads. The Force features eight (8) 360° touch-capacitive knobs, one (1) large 360° encoder for display navigation and selection input, and five (5) 270° knobs for gain, mix, and level adjustments. Yes, the Force always requires a power supply. It includes a 19V, 3.42A, center-positive power adapter. How many inputs does the Force have? How many outputs does the Force have?